Forgot Windows XP administrator password? Can’t log in to your system and lose access to your important files? If that’s your only problem, then you probably have nothing to worry about. As long as you have your Windows XP installation CD, you can hack Windows XP password using a simple but effective method made possible by a little known access hole in Windows XP. This method is easy enough for newbies to follow – it doesn’t require using the Recovery Console or any complicated commands. 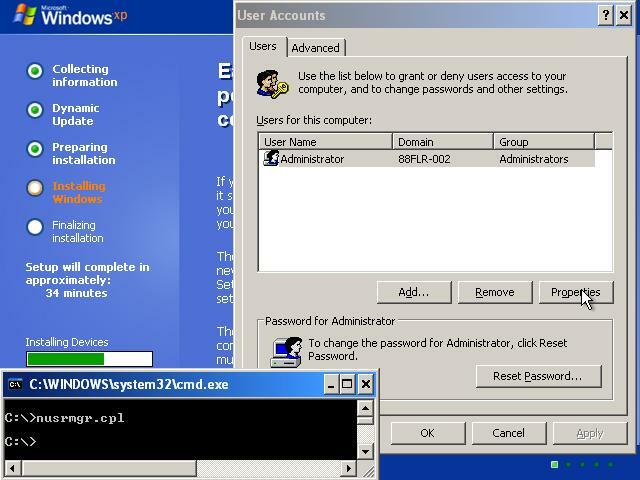 And it’s free – I mention that because you can pay $20 for an emergency download of Reset Windows Password utility which can help you reset/blank forgotten administrator password on all versions of Windows. 6. The next screen is the Setup screen which gives you the option to do a Repair. It should read something like “If one of the following Windows XP installations is damaged, Setup can try to repair it”. Use the up and down arrow keys to select your XP installation (if you only have one, it should already be selected) and press R to begin the Repair process. 12. Now simply pick the account you need to change and remove or change your password as you prefer. If you want to log on without having to enter your new password, you can type control userpasswords2 at the prompt and choose to log on without being asked for password. After you’ve made your changes close the windows, exit the command box and continue on with the Repair.